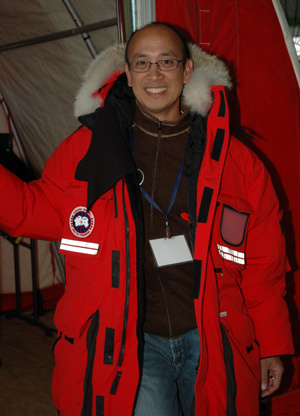 Ignatius Rigor is a climatologist at the Polar Science Center, Applied Physics Laboratory (APL), and an affiliate assistant professor in the School of Oceanography at the University of Washington (UW) in Seattle. Dr. Rigor studies sea ice, and how it interacts with the atmosphere and ocean. His primary tools for research are observations from drifting buoys and satellites. Sea ice is one of the primary indicators of climate change. The ice waxes and wanes driven by variations in sunlight and temperature. Changes in wind also play an important role by redistributing the ice across the Arctic Ocean creating areas of open water, and by compressing this ice into ridges. Making sense of the complex interplay between the air, ocean and sea ice is a challenging puzzle that motivates Dr. Rigor’s research. Specifically, his research projects include: 1) reconstructing Arctic surface air temperatures; 2) assessing estimates sea ice thickness from satellites and in situ observations; 3) deciphering the role of sea ice in ocean and atmospheric chemistry; and 4) coordinating the International Arctic Buoy Programme. Studying climate change was not something Dr. Rigor ever dreamed of doing, but was fortunate to have been exposed to research when he was hired out of high school to be an undergraduate student assistant at APL/UW in 1981. After completing his B.S in 1986, he joined the APL staff as a Research Scientist. In 1998, he was awarded an APL/UW Graduate Fellowship to study Atmospheric Science working with John “Mike” Wallace, and completed his M.S. in 2002, and his Ph.D. in 2005. For additional information on Ignatius Rigor’s research and on going projects visit his web page. For a panoramic “gigapan” view of IABP field work taken by Chris Linder click here. This was photographed from the top of a ridge at the edge of landfast sea ice near Barrow, Alaska. Ignatius Rigor collaborated on a study of Antarctic sea ice change using satellite observations. Read the paper presenting the findings in the journal Remote Sensing of Environment. Nghiem, S.V., I.G. Rigor, Pl Clemente-Colón, G. Newmann, and P.P. Li, Geophysical constraints on the Antarctic sea ice cover, Remote Sens. Environ., 181, 281-292, http://dx.doi.org/10.1016/j.rse.2016.04.005, 2016. Nghiem, S. V., I.G. Rigor, A. Richter, J.P. Burrows , P.B. Shepson, J. Bottenheim, D.G. Barber, A. Steffen, J. Latonas, F. Wang, G. Stern, P. Clemente-Colón S. Martin, D.K. Hall, P. Tackett, G. Neumann, and M.G. Asplin, Field and satellite observations of the formation and distribution of Arctic atmospheric bromine above a rejuvenated sea ice cover, J. Geophys. Res., 117, D00S05, doi:10.1029/2011JD016268, 2012. Hutchings, J., and I. Rigor, Role of ice dynamics in anomalous ice conditions in the Beaufort Sea during 2006 and 2007, J. Geophys. Res, v. 117, C00E04, 14, doi:10.1029/2011JC007182, 2012. Nghiem, S.V., P. Clemente-Colón, I.G. Rigor, D.K. Hall, G. Neumann, Seafloor control on sea ice. Deep- Sea Res. II (2012), http://dx.doi.org/10.1016/ j.dsr2.2012.04.004, in press, 2012. Stroeve, J. C., J. Maslanik, M. C. Serreze, I. Rigor, W. Meier, and C. Fowler, Sea ice response to an extreme negative phase of the Arctic Oscillation during winter 2009/2010, Geophys. Res. Lett., 38, L02502, doi:10.1029/2010GL045662, 2011. Nghiem, S.V., I.G. Rigor, P. Clemente-Colón, D. K. Perovich, and G. Neumann, New record reduction of Arctic perennial sea ice in winter 2008, Jet Propul. Lab. Doc. D-44233, Pasadena, Calif., 2008. Haas, C., A. Pfaffling, S. Hendriks, L. Rabenstein, J.-L. Etienne, and I. Rigor, Reduced ice thickness in Arctic Transpolar Drift favors rapid ice retreat, Geophys. Res. Lett., 35, L17501, doi:10.1029/2008GL034457, 2008. Ogi, M; Rigor, IG; McPhee, MG; Wallace, JM, “Summer retreat of Arctic sea ice: Role of summer winds”, Geophys. Res. Lett., vol. 35, 10.1029/2008GL03567, 2008. Intergovernmental Panel on Climate Change (IPCC) Working Group I, Contribution to the Fourth Assessment Report of the IPCC – Climate Change 2007: The Physical Science Basis. (Rigor, I.G. is a Contributing Author). Sasaki, Y.N. Y. Katagiri, S. Minobe, and I.G. Rigor, Autumn atmospheric preconditioning for interannual variability of wintertime sea-ice in the Okhotsk Sea, J. Oceanography, v. 63, n. 2, pp. 255-265, 2007. Nghiem, S.V., I.G.Rigor, D.K. Perovich, P. Clemente-Colón, J. Richter-Menge, J. W. Weatherly, and G. Neumann, Rapid reduction of Arctic perennial sea ice, Geophys. Res. Lett., iv. 24, L19504, doi:10.1029/2007GL031128, 2007. Richter-Menge, J.A., and many other including I.G. Rigor, State of the Arctic. FY 2005 NOAA Annual Report: The State of the Ocean and the Ocean Observing System For Climate, ed. Diane M. Stanitski, NOAA Office of Climate Observation, Silver Spring, MD, 20910. USA, 2006. Richter-Menge, J.A., D.K. Perovich, B.C. Elder, K. Claffey, I.Rigor, M. Ortmeyer, “Ice Mass Balance Buoys: A tool for measuring and attributing changes in the thickness of Arctic sea ice cover“, Annals of Glaciology, V.44, 2006. Rigor, I.G., and Jackie Richter-Menge, Sea Ice Extent and Thickness. FY 2004 NOAA Annual Report: The State of the Ocean and the Ocean Observing System For Climate, ed. Diane M. Stanitski, NOAA Office of Climate Observation, Silver Spring, MD, 20910. USA, pp. 67-74, 2005. Rigor, I.G., Interdecadal Variations in Arctic Sea Ice, Ph. D. Dissertation, Univ. of Washington, Seattle, pp. 100, 2005. Rigor, I.G., and Jackie Richter-Menge,’ Sea Ice Extent and Thickness. FY 2004 NOAA Annual Report: The State of the Ocean and the Ocean Observing System For Climate’, ed. Diane M. Stanitski, NOAA Office of Climate Observation, Silver Spring, MD, 20910. USA, pp. 67-74, 2005. Rigor, I.G., J. Richter-Menge, C. Lee,’ Arctic Sea Ice and Ocean Observations’, Arctic Research of the United States, v. 19, 2005. Eicken, H., R. Gradinger, A. Graves, A. Mahoney, I. Rigor, and H. Melling,’ Sediment transport by sea ice in the Chukchi and Beaufort Seas: Increasing importance due to changing ice conditions?’, Deep Sea Research, 2005. Rigor, I.G. and J.M. Wallace, Variations in the Age of Sea Ice and Summer Sea Ice Extent, Geophys. Res. Lett., v. 31, doi:10.1029/2004GL019492, 2004. Rigor, I.G., J.M. Wallace, and R.L. Colony, Response of Sea Ice to the Arctic Oscillation, J. Climate, v. 15, no. 18, pp. 2648 – 2668, 2002. Rigor, I.G., R.L. Colony, and S. Martin, Variations in Surface Air Temperature in the Arctic from 1979- 1997, J. Climate, v. 13, no. 5, pp. 896 – 914, 2000. Warren, S.G., I.G. Rigor, N. Untersteiner, V. F. Radionov, N. N. Bryazgin, Y. I. Aleksandrov, and R. Colony, Snow Depth on Arctic Sea Ice, J. Climate, v. 12, no. 6, pp. 1814–1829, 1999. Jones, P.D., M. New, D.E. Parker, S. Martin, and I.G. Rigor , Surface air temperature and its changes over the past 150 years, Rev. Geophys. Vol. 37 , No. 2 , p. 173 – 200, 1999. Landa, E., E. Reimnitz, D. Beals, J. Pochkowski, and I.G. Rigor, Transport of 137Cs and 239,240Pu by Ice Rafted Debris in the Arctic Ocean, Arctic, v. 51, no. 1, pp. 27-39, 1998. Pfirman, S.L., R. Colony, D. Nurnberg, H. Eicken, and I.G. Rigor, Reconstructing the Origin and Trajectory of Drifting Arctic Sea Ice, J. Geophys. Res., vol. 102 no.6 pp. 12575-12586, 1997. Pfirman, S.L, J.W. K_geler, and I.G. Rigor, Potential Shortcuts for Transport of Contaminants from the Kara Sea, Sci.Total Environ., vol. 202, pp. 111-122, 1997. Rigor, I.G., and R. Colony, Sea Ice Production in the Laptev Sea, Sci. Total Environ., vol. 202, pp. 89- 110, 1997.